In my district, word walls have been a hot topic for a while. Are you required to have word walls in your lower elementary classrooms? What words go on the word wall? Are they the same as your weekly spelling words? Do you also put other words on the word wall? Should words be added to the word wall each week? Do you start the year with all of the words up? Do you start the year with the words from the previous grade up? How do you teach the students strategies for using the word wall? How do you model interacting with the word wall? So many things to think about...no wonder this is a topic of discussion. There are many, many fabulous ways to use the word wall that are happening in my own building, in my district and in classrooms around the country. I am by no means a "word wall expert". 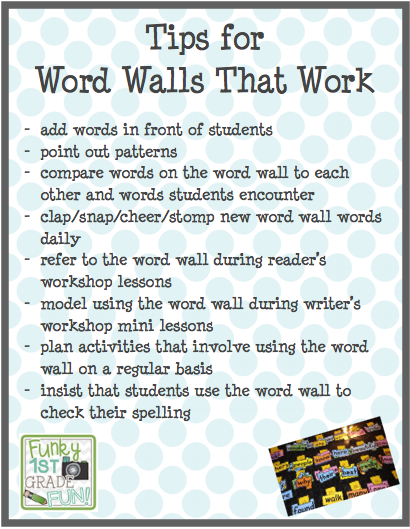 But, here are my own answers about how I use the word wall in my classroom. My answers do not represent the decisions made by my district - because those decisions have not all been made by the big powers that rule the word wall. I'm kind of required. Plus, I do think it's a valuable tool (especially if it's used carefully). Our weekly spelling words (which are Dolch words), but not the word family (vowel patterns) that we study are the ones that I put on my classroom word wall. I don't include the word family patterns on my word wall, because I want the word wall to be a place for students to find high frequency words. We make anchor charts with different word family patterns as we study them. 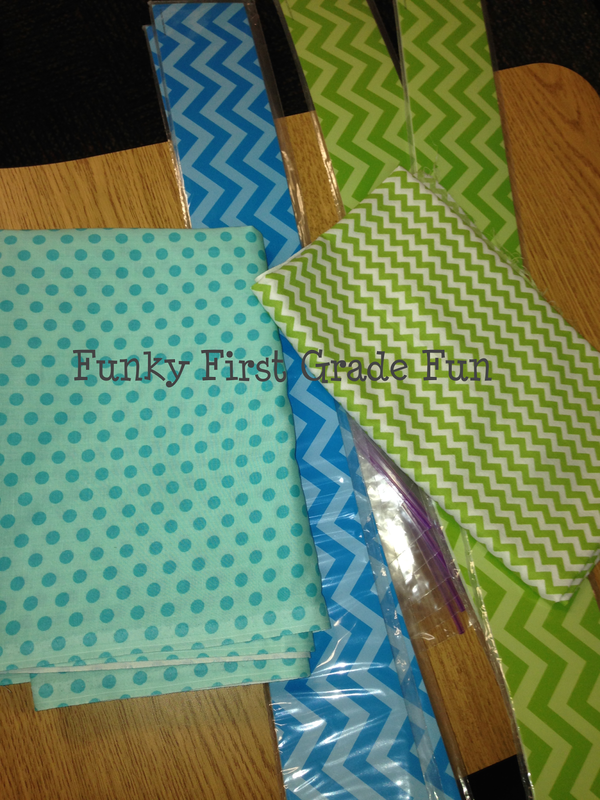 Those are kept in other places in the room so students can refer to them as we are learning each specific pattern. Yes, the word wall words are our weekly spelling words. In my classroom we add the spelling words each week. That allows us to have practice using only a handful of new words on the wall each week before other words are added. Nope. I have a system for introducing and adding the words. The words are added in front of the students and we talk about the words for the week during our Monday morning meeting. I recently talked to some teachers from another district who said they were required to put up the words from the previous grade to start the year. My word wall starts empty. When I started this post, I realized that I don't have a current photo of my word wall. And...I won't have a photo of my "new" word wall for a couple weeks because all of my teaching treasures are currently in the hallway outside my new room. My word wall has gone through a couple makeovers since the picture above and I'm ready for another makeover this year. I purchased fabric and borders this summer. I'm thinking about using some combination of these on my new word wall. Thank you, schoolgirlstyle.com for the chevron borders! I recently sorted all of my words, so I can figure out which words I need to make since I'm looping with my class to 2nd grade this year. Isn't my granite pretty? I love it. Shhhhh... I use Windex on it all the time. I know. I know. Pretty soon it will probably develop giant craters. Blah. Blah. Blah. 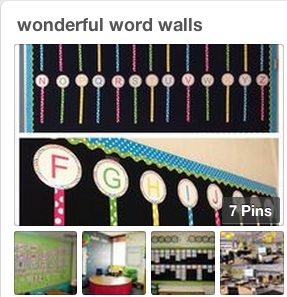 I've also been collecting pins of my favorite word walls on Pinterest. You can click on the image below to check out my favorites. Each year, I assess the students to find out if they can read and spell the words from the previous grade at the beginning of the year. If there are words from the previous year's list that a child can not spell, I work on those individually with that child. Since the words on my word wall are "spelling words", I want my students to have as much practice as possible interacting with the words throughout the week. A couple years ago, I posted about the super spelling slippers my students are invited to wear during our spelling tests. You can read that super old post here. Yes, I give spelling tests. I don’t mind if some folks don’t like my “spelling tests”. I also don’t care if other folks (even on my team) choose to give spelling tests or not to give spelling tests. I feel lucky to work in place where we have some freedom to make those decisions based on what we feel is best for our students. I give spelling tests for 3 reasons. 1. It teaches accountability and responsibility. 2. I use the weekly assessments to plan my instruction for the following week. 3. My students count on and look forward to our weekly spelling routine. Part of our weekly spelling routine is to do the Super Spelling Power Stations from my Super Spelling Forms pack. 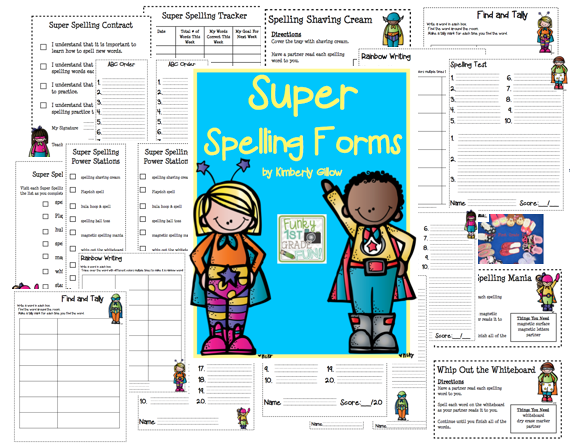 Super Spelling Forms includes lots of different spelling forms and directions and checklists for my Super Spelling Power Stations. The best things about the Super Spelling Power Stations are that it is a routine (not weekly stations that you have to keep creating/changing). The words change each week in our spelling program, but the Super Spelling Stations routine stays the same. Lots of the Super Spelling Stations involve movement, since many students learn best when they are active. Some of the stations also require students to interact with the word wall. Each day, my students interact with the word wall during literacy workstations and during Super Spelling Stations. During our morning message, students solve mystery words by using the word wall each day. They also stomp, cheer or clap each word wall word in our morning message. During read alouds or close reading activities that I do for reader's workshop, I refer to any new or "tricky" words that are on our word wall. I also model using the word wall to help me decode new multisyllabic words that have smaller word wall words in them. For example, if I came upon the word "makeshift", I would point out that "make" is on our word wall. The most helpful time for me to model strategies for using the word wall is during my writer's workshop mini lessons. Modeling strategies for using the word wall during writer's workshop helps my students remember that I expect them to use the word wall to help them spell the words correctly or to CHECK THEIR WORK. That's in big letters because it seems like I'm always yellin' that out. Ha! As I plan to redesign my word wall for this year, I'd love to see pictures of your word walls! Anyone want to share a pic with me? You can send them to me via email or I'd be happy to visit your blog or Instagram page if you have pics of your word wall there. Just leave me a message and I'll hop on over to check it out. Loads of great information there - thanks for sharing. I do have high frequency words up on display but (and it seems crazy now I've seen yours) not in alphabetical order. I am definitely going to fix this ready for September and add them gradually rather than all in one go too! Thanks for stopping by to read my post! 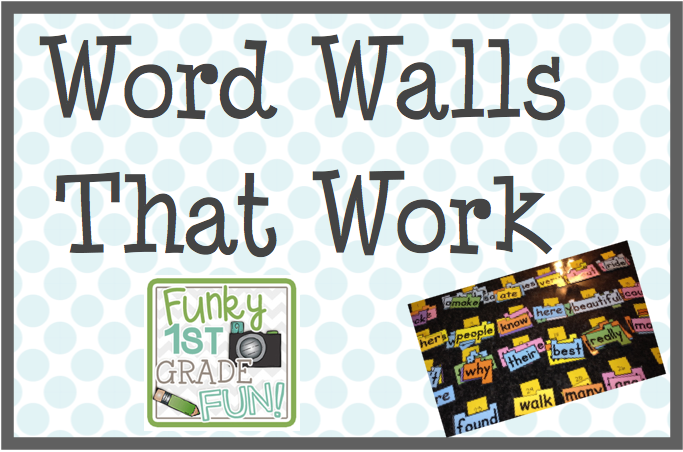 I love to hear about how other teachers use the word wall. P.S. I give spelling tests too! Hi Crystal, Thank you for stopping by to visit my blog! Since our spelling words are high frequency words...it makes things a tiny bit less complicated I guess. Thanks for sharing your word wall strategies! I've had a high frequency word wall for 20 years. I've added new words weekly. Some years I gave spelling tests, others I did not. This is the first year I am not starting with a blank board. I want to try something different and give my students all the words they're expected to know by the end of first grade. I've had quite a few students writing at higher levels who were ready to check their spelling and use the wall. I will have a smaller board that I'll place at my HFW station that will have the focus words of the week on it. I am going to check out your Super Spelling Forms! Thanks for stopping by to read my post! I love to hear about how other teachers use the word wall. I'd love to know what you think after you try starting with some words on the wall this year.